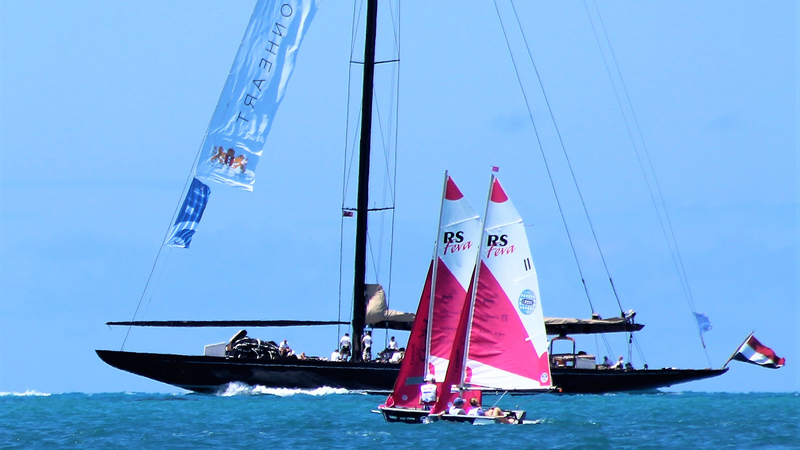 For the first time at an America’s Cup there has been a Junior Regatta alongside the main event. The brain child of Sir Russell Coutts, and run by the Endeavour Program this event was designed to inspire the next generation of young sailors. It is fair to say that this event has blown at least 32 young sailors away! As the RS Feva sailors arrived with their chaperones on Monday, the America’s Cup Endeavour Program staff did an amazing job of getting everyone to where they needed to be. RS Sailing had arranged accommodation on the beautiful Port Island for all the RS Feva sailors taking part in the regatta. The stunning Port Island is located between the Great Sand and Hamilton in the Warwickshire parish. This amazing little island would become the base camp for the week. Whenever there was a quiet moment swimming and kayaking were a must. The chaperones and the parents soon found a way to fill the fridge with cold beers, and spend time under the veranda looking out over the kids having fun discussing who’s going to win the America’s Cup. Day one of the event started with the sailors arrival at the America’s Cup Endeavour base. 16 charter boats were soon allocated to the 16 teams from 12 nations. Eight of the charter boats belong to the Endeavour Program itself. 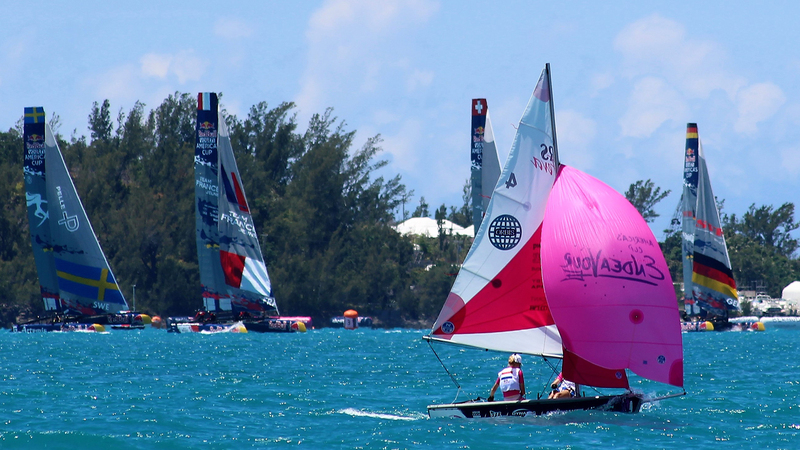 The other boats were kindly loaned by the Royal Bermuda Yacht Club. The sailors took some time to familiarize themselves and tinker with their boats making sure they were set up in a way they are used too for racing for this regatta. That afternoon the young sailors were in for their first treat, a ride on the beautiful Spirit of Bermuda, the trip took the group all the way to Hamilton and back to the Docklands dockyard. A nice fly past by Groupama Team France and a guided tour around this classic boat made for a special afternoon. At the end of a very long day a wonderful ferry boat ferry pilot called JR returned us all back to the island for more swimming and kayaking. The last chance to get the boats set up. Sailors had a quick briefing from Hayden Whitburn, Northsails legend, PRO for the RS Feva event. The 16 RS Feva’s made their way onto the water and out through the Docklands across the Great Sound to Spanish point. Three quick practice races were completed giving the race committee and the sailors a great chance to get used to the conditions on the course. The length of each race was a target time of 22 minutes to make it as much like the America’s Cup racing as possible with the windward and leeward gates, giving the kids lots of tactical options on which way to go at the top and the bottom of the course. 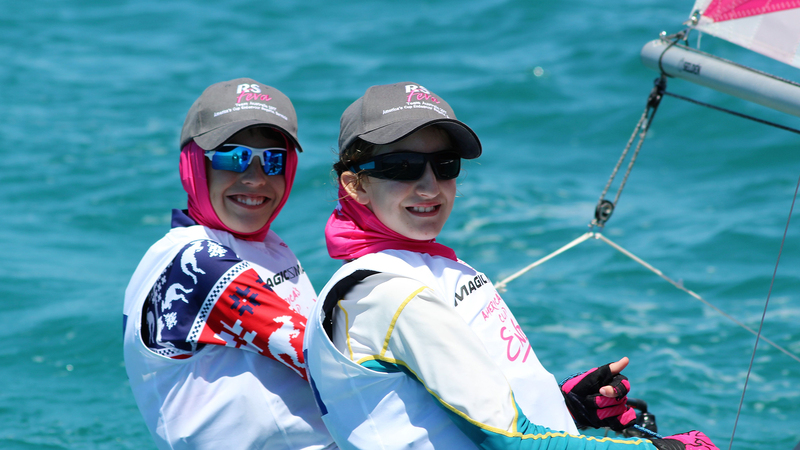 The surprise leader on the first practice race was a young team from Bermuda, Ruth and Joanna. Both sailors had learnt to sail through the Endeavour Program and had less experience than the rest of the sailors here so this was a fantastic result for them. Once it was clear that the race committee and the sailors were well practiced it was back to the boat park and off for an evening with some of the Red Bull Youth America’s Cup sailors. The RS Feva sailors had the opportunity to get on board an AC45, the official Youth America’s Cup boat. Everyone was treated to a guided tour of the boat and shown how all the systems work together, the enthusiasm and attention of each crewmember was fantastic. The young sailors were really engaged trying to understand how it all works and the opportunity to chat, hang out, ask questions to a bunch of professional sailors and of course get a few autographs was an experience they will not soon forget. With amazing blue skies, 10 to 12 knots of breeze, the Sound was the perfect setting to start the regatta. The course was quickly laid and no time was wasted in getting the first race away. Races 1 to 6 race were raced with great conditions. The forecast for Friday was very light so the more races the committee could get in today, the better. It is fair to say Eli Liefing and Rose Dickson from New Zealand owned the day with 4 firsts and 2 seconds, putting them at the front the fleet by the end of the day. Closely followed by Oscar Andersson and Amanda Ljunggran from Sweden with 2 firsts and 3 seconds. Issy and Harvey, a mixed crew from Great Britain made up the top 3 with a very consistent day. The stand out performance of the day however goes to Rohan and Stella from USA, with a 4th place and 11th overall. 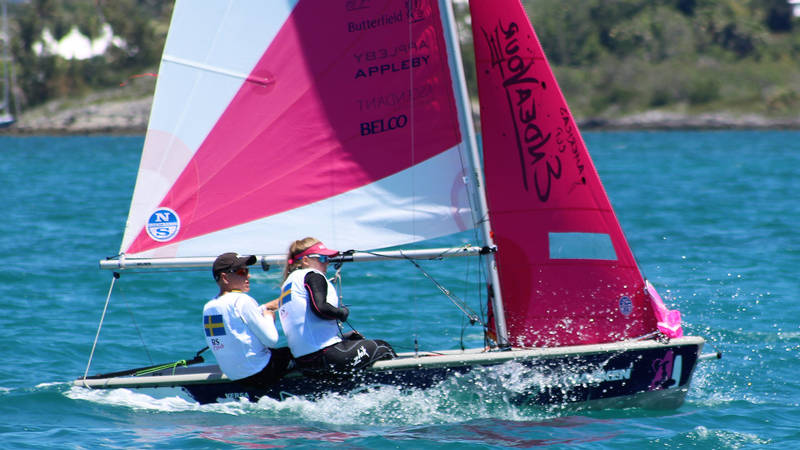 Bermuda sailors Millie Lewis and Laura Hupman were leading the way with a 4th place overall also. With racing complete, there was no rest as the sailors headed to Morgans Point, the home of Artemis Racing and the temporary sail loft of North Sails for a go at Blo Karting. Another new experience for most, you could see it was a great one! After the previously sailed races from day 1 the fleet after the 6th were really close but it was easy to spot the sailors who have the most experience and have competed in larger events before. The Committee boat headed back on to the Great Sound in search of wind, after a while there was enough breeze to get a race away. Race 7 in very light airs was won by Francesco and Alvise from Italy. 2nd was Eli and Rose from New Zealand and 3rd was Rohan and Stella from Australia. 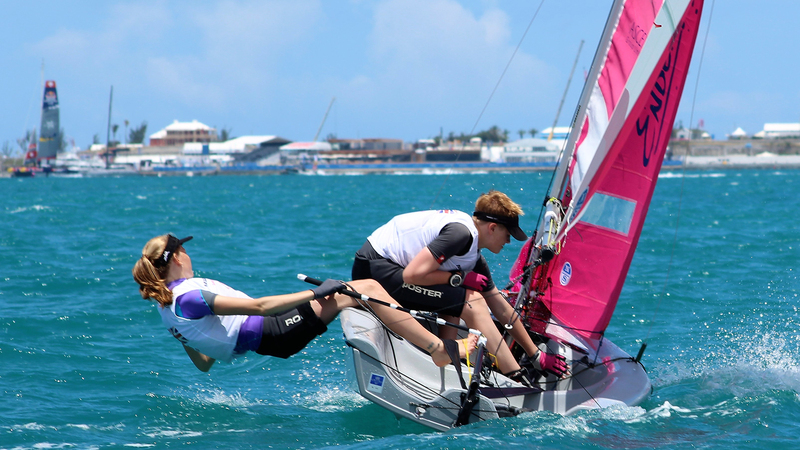 Bermudan sailors Millie & Laura were a fantastic 4th. Unfortunately, the wind soon vanished and there would be no more racing that day. 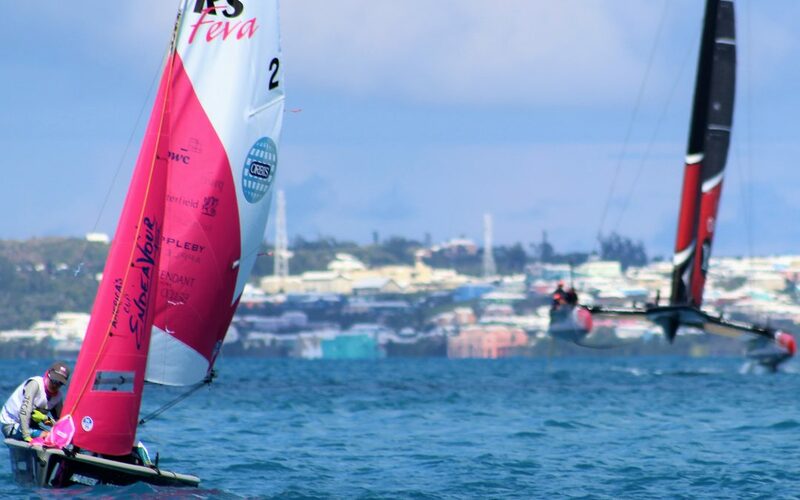 After a light day of racing, the young sailors had some well-deserved down time, snorkelling in Bermuda’s famously clear waters, swimming, playing volley ball on the beach and generally just hanging out. With no sailing on day 5 for the RS Feva sailors, they had the chance to soak up the amazing atmosphere at the America’s Cup Village and experience the first day of the America’s Cup match. Day Six – Show Time! The America’s Cup RS Feva Endeavour Junior Regatta took centre stage as the Half Time Show. The sailors had a chance for a couple of quick practice races on the short course just off the grand stand before the main event. The race in 12 knots of breeze, 5000 enthusiastic spectators in the grand stand, broadcasted to 140 countries was truly an amazing experience for all involved. The prize giving took everyone back to the main stage in the Village. On behalf of all the sailors, chaperones and parents who had the opportunity to be part of this amazing event, this has been a week full of new experiences for all and ones we will not be forgetting any time soon. Friendships have been made for life and we go away with the most amazing memories. This would not have been the case if the whole event wasn’t put together so superbly by the Endeavour Program – so for that, we say a huge thank you!